Does your pet have a fear of fireworks? All pets are likely to hear fireworks in their lifetime and most owners will be all too aware of the great stress and upset they can cause. Fear is a natural reaction to loud, unfamiliar noise, but we don’t want that fear to become a phobia. To help prevent pets from becoming over-anxious when fireworks are heard, here are a few top tips. A few weeks before fireworks’ season, make a den for your pet somewhere that they can hide and fell safe. This could be under a table, in a cupboard or behind a sofa. Use favourite blankets and toys to block out sound and encourage the pet to use the area. On the day, keep windows and door shut and close curtains. Lock cat flaps and block them off to prevent cats escaping. Get cats indoors well before dark. Play music or turn up the TV to mask noise. Move outdoor pets in for the night or partially cover hutches and provide lots of hiding places. Do not reassure your pets when they are scared as this only helps to reinforce their fearful behaviour and makes the problem worse. Stay calm yourself. If you are anxious, your pet will be anxious. Consider using a pheromone diffuser. Adaptil for dogs and Feliway for cats are a great way to help reduce anxiety by releasing calming natural pheromones. Please call us or ask at reception for more details. 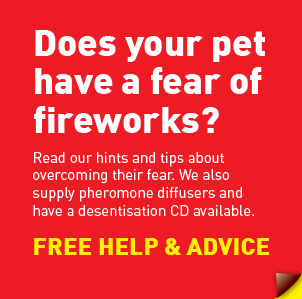 If you can, reduce a fireworks phobia earlier in the year with a desensitisiation programme such as ‘Sounds Scary CD’ or ‘Fear of Fireworks’. Starting early is the key to success and there is a step-by-step programme to follow to reduce your animals’ fear of loud noises. Please call or ask at reception for advice and details.